Everyone loves to travel and explore new places that they haven’t been before. Some trips go better than others and this can be for many different reasons. One of the best ways to get the best experience from your trip is to know a little about the local secrets that each town has – the hidden gems in the community. That is exactly what I want to provide: How to have a better Zion vacation. If you’re like me, you like to travel but not with hundreds of random strangers. Nature is best enjoyed with family and friends in quiet serenity. Zion is one of the most visited National Parks in the United States, but it does have times that are slower than others. Towards the end of July and the beginning of August are great times to visit. School hasn’t started yet in most places, but you won’t have a hard time booking a hotel room or waiting in lines to get on the shuttles. If you aren’t a fan of the heat, November is a great time to travel. Zion has mild winters which allows the majority of the trails to stay open. The national park website has status updates each day of which trails are closed and why. There aren’t many people that travel during this time and hotel prices are down from their summer rates. With the increase of visitors each year, parking in Zion and Springdale has grown into a nightmare. Only the people that wake up early are lucky enough to get a parking spot at the visitor’s center. There are parking lots that have recently been created to help alleviate traffic and allow people to stay closer to the park. However, you have to pay to stay there. Most of the hotels in Springdale allow free parking if you are staying with them. From there, you are able to take the free shuttle that circles around the town to the entrance of the park. Doing so will take away the stress of having to waste extra time finding the ‘best’ parking spot. Be careful though, most hotels issue a parking pass of some kind and check them daily and tow those cars that are parked without the permits. Zion has a lot of history and no one knows it better than the park services. The shuttle that runs inside of the park has an audio track played through the speakers as it makes the journey up the canyon to the Temple of Sinawava. It explains how Zion came to be, certain events that happened inside the park and different names of the mountains. The facts are extremely interesting, and the ride is a great time to rejuvenate your energy before continuing your hike. If you arrive to Springdale later in the day and don’t have time for a hike, a round trip on the shuttle takes about 80 minutes with all the stops. While on the shuttle, look out the window and keep your eyes open as it is very common to spot wild animals roaming in their natural habitats. Springdale sits in the middle of many great attractions. With Zion so close, many people overlook all the other things they are able to do. Bryce Canyon National Park and Snow Canyon State Park are only an hour away. Sand Hollow State Park is 45 minutes away and a great place to cool off after a day of hiking. It features beautiful red cliffs that surround it and a spot to cliff jump as well as beaches to relax and play with your family in the sand. Sand Hollow has a store to rent boats or wave runners as well. There are many incredible mountain biking trails that are close including those that are featured by the world-famous Red Bull Rampage. Other locations that are close by include Silver reef, Valley of Fire and Coral Pink sand dunes. Unpack once and spend more time exploring these great areas! A little-known fact about the shuttles is that they have spots on the front where bikes can be stored. A fun activity to do is take these bikes up to the last stop in the canyon and then ride them back down to the visitor’s center. The majority of the ride is downhill, allowing for a relaxing ride with the fresh air blowing across your face. As you get closer to the entrance of the park, there will be a sign that says “Pa’arus trail access”. This trail is one of the few that are bicycle accessible. It has a wonderful view of the back-country parts of Zion and another spot where wild animals are known to be seen. A road bike rental can cost less than $50 for the entire day, allowing for more exploring to be done after cruising in the Zion. This is a less known trail that has a great view of Zion Canyon that differs from that of Angels Landing. Canyon Overlook is accessible by driving your car over to East Zion. It lays immediately to the left after exiting the first tunnel from the Springdale side. There is a small parking lot to the right, and not too much farther up the road lies more parking. The hike itself is 1-mile roundtrip and levels out after the initial stairs that lie at the beginning of the trail. The trail ends with a safety fence and a plaque describing the part of Zion that you are able to see from there. During summer, Southern Utah reaches temperatures of 100 degrees +. It is important to stay hydrated and cool! The Virgin river flows through Springdale and is calm the majority of the year. This is the same river that carved out Zions’ mountains for millions of years! There are businesses in Springdale that rent out tubes to float down the river. This is an activity that is great for kids as well as adults. The company that rents the tubes also provides transportation as you exit the river to take you back to where you left your car. Depending on the time of year and how fast the river is flowing, it takes about 2 hours from start to finish. One of the keys to having a great experience in Zion is to stop by the Bumbleberry Gift Shop and try some bumbleberry pie! We make them fresh in our own bakery as well as jams, jellies and other baked goods. Your sweet tooth will love you for stopping in! After stopping by the bakery, our gift shop has plenty of fun souvenirs, t-shirts, hiking shoes and more for you to browse. You won’t regret treating yourself to some pie and ice cream. As the saying goes, the first trip you come for Zion. The second trip, you come for Bumbleberry Pie! The number one reason visitors flock to Zion National Park each year is for the incredible hiking opportunities. When it comes to different hikes within the park, Zion presents nearly endless possibilities. Hikers can enjoy strenuous hikes that take days to complete or just take a light stroll through paved walkways. Since there are many choices of easy, moderate, or strenuous hikes, visitors of all experience and fitness levels will enjoy the trails of Zion. Even those who are not avid or experienced hikers will be able to fill many days with entertaining hiking excursions. With three difficulty levels to choose from and something different to enjoy on each trail, every hike through Zion will be an unforgettable adventure. Just because a hike is easy doesn’t mean it’s boring. The easy hikes throughout Zion National Park have many amazing views of the landscape. Most easy hikes take less than two hours to complete and will be on smooth trails. Hikers will not encounter difficult obstacles to overcome during these hikes, either. Though the hikes are short and leisurely, they are packed with experiences that will create unforgettable memories. This short, easy hike has an unbelievable scenic view without having to hike for miles or drudge up steep ascents. At about a mile long, this hike takes less than an hour to complete, which means many hikers will spend more time marveling at the view than they spend hiking. To get to Canyon Overlook Trail, visitors should go to the east end of Zion National Park. They will park their vehicles just before the Zion-Mt. Carmel tunnel. From here, it is a short hike from the road that leads into a large, breathtaking cave. When hikers emerge from the cave, they will be treated to an amazing view of the park. This is the perfect hike for every visitor who wants to see the best of Zion and take some Instagram-worthy photos. Beautiful iconic scene of The watchman at sunset, Zion National Park, Utah. This hike is about as leisurely as a stroll through Zion can get. An even walking surface and shaded environment make this trail perfect for families. There are many incredible sights to see and a refreshing surprise at the end of the trail. Riverside Walk takes hikers from the Temple of Sinawava to the Virgin River. This two-mile-long hike is known as the Gateway to the Narrows because the end of this trail is the beginning of the popular Narrows trail. When the entrance of the Narrows is reached, hikers can wade and splash through a refreshing pool of water before they head back. This short hike, which takes most hikers around two hours to complete, is an incredible way to experience the beauty of Zion without embarking on a long, strenuous journey. Among the many beautiful rock formations throughout Zion National Park is the Watchman. This formation shoots from the ground, towering above the vast red rock landscape. The Watchman Trail doesn’t climb to the staggering heights of the Watchman, but it does give a fantastic view of the formation from ground level. 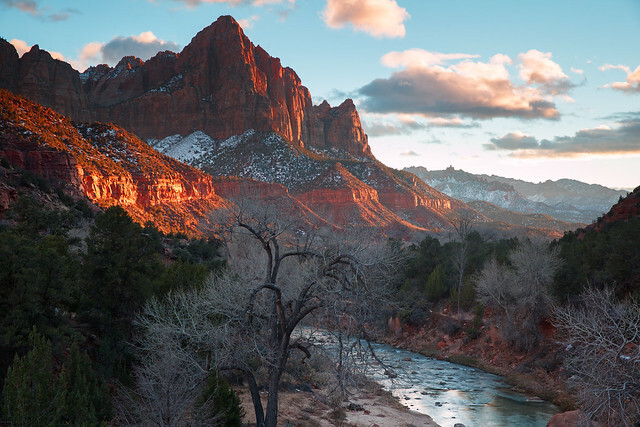 The Watchman Trail is a three-mile-long hike that is a hidden gem within Zion. It is usually not crowded, so hikers can enjoy some peace and quiet on this hike. This hike takes about three hours to complete and will lead hikers along a red rock trail which is rough in some portions but can be completed by even the most inexperienced hikers. Since this trail is not shaded, it is best done in the morning or evening to avoid the scorching midday sun. Hikers and their families will love the connection they will feel with Zion during this light hike. Trails that are deemed moderate are usually difficult enough to challenge hikers of all experience levels in terms of distance and technical challenges. However, they are not so difficult that a physically fit novice wouldn’t be able to complete them. Moderate hikes can take anywhere from a few hours to a full day. They can be challenging both physically and mentally, but these challenges are well worth it. After completing one of these moderately difficult hikes, hikers will feel an overwhelming sense of accomplishment. There are two ways to hike the Narrows, but the least strenuous way to hike it is from the bottom up. 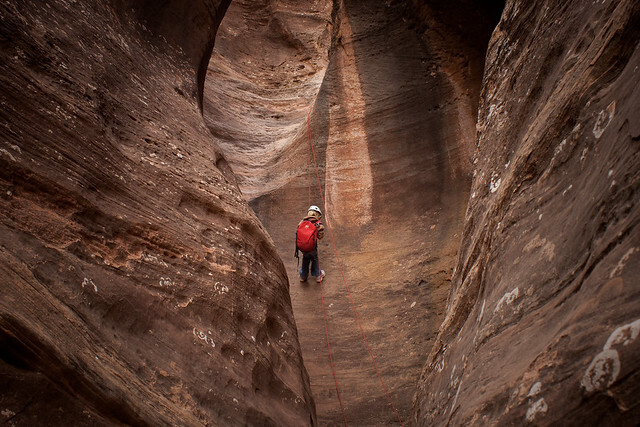 This route doesn’t require technical skills like climbing and rappelling, but it still gives an incredible view of the slot canyon. Steep canyon walls and a floor of shallow water will engulf hikers in the Zion landscape. The entrance of the Narrows, at the end of Riverside Walk, ushers hikers into a completely different world. The average length of this hike is anywhere from three to eight miles and takes around two to six hours. This narrow slot canyon is an out and back trail, which means hikers can turn around whenever they please. However, making it to the Wall Street portion of the Narrows should be the goal, as this portion of the canyon, with its high, smooth walls, is an unforgettable experience. Hiking any portion of Zion Narrows will be the highlight of a trip to Zion. There is no better view of Zion National Park than the one found at Observation Point. For hikers that can handle it, this moderately strenuous hike is a must-see while in Zion. Not only are the views incredible, but the physical challenges along the way will bring out a sense of pride and accomplishment in all who complete it. The Observation Point Trail begins at the Weeping Rock Trailhead and leads up to the area of Observation Point. The trail is eight miles long and will take the average hiker around four to six hours to complete. The climb is steep and leads hikers up to elevations of over 2,100 feet. The trail is hard paved rock, manmade from the canyon walls, so the rocky terrain isn’t an issue in most areas. The strenuous part of this climb is the steep elevation and the unrelenting sun. However, once the trail is completed, the view at the top is one of a kind. Perhaps the most well-known trail in Zion National Park, Angels Landing is full of incredible views, staggering heights, and daring challenges. The high elevations and narrow trails on this path will test the mental and physical fortitude of all who attempt it. Angels Landing begins at the Grotto trailhead and leads hikers along a precarious red rock ridge. This five-mile-long trail, which takes around two to four hours to complete, features switchbacks, rocky terrain, and breathtaking heights. This trail gets so high and so precarious that it is not recommended for hikers who are uneasy with heights. Once hikers have reached the end of the hike they will have an unbelievable view of Zion. Those who dare embark on this journey will find that is was well worth the trip. Difficult hikes are certainly not for inexperienced hikers. These hikes are long, grueling, and can take many days to complete. They often involve camping in the wilderness, using technical skills like rappelling and climbing, and having advanced knowledge of the landscape. The terrain of difficult hikes is incredibly unpredictable, ranging from steep climbs to deep pools of water and everything in between. Embarking on a difficult hike through Zion will be one of the most difficult and rewarding experiences of a hiker’s life. This gorgeous trail along the red rock landscape leads to a massive arch formation with a beautiful scenic backdrop. Seeing Kolob Arch, which is the second largest arch in the world, is something that experienced, physically fit hikers can do in Zion National Park. It is one of the most beautiful formations in the park and provides endless photo opportunities. This hike will take an entire day but will not require camping overnight. The 14-mile-long trail takes most hikers a full twelve-hour day, hiking from dawn to dusk. The trail is long, exposed to the harsh sun in many places, and has moderately rocky terrain. Whether hikers take Kolob Canyons Road at Lee Pass or Hop Valley Trailhead to get to Kolob Arch, it will be a long journey with a beautiful, scenic payoff. Avid hikers who are looking to get away from the crowds on more popular trails will love hiking The Barracks. This section of Zion is on the East Fork of the Virgin River. It gives visitors all the amazing views they would see on the North Fork, but none of the crowding. This 20-mile-long journey is not for the faint of heart. This hike takes most people two or three days to complete. Parts of this hike are along Parunaweap Canyon where the layers of red rock on the canyon walls surround hikers. Other portions are in the heat of the sun on the rocky landscape. Since this hike requires camping, hikers will need to obtain the proper camping permits and make sure they adhere to park rules. 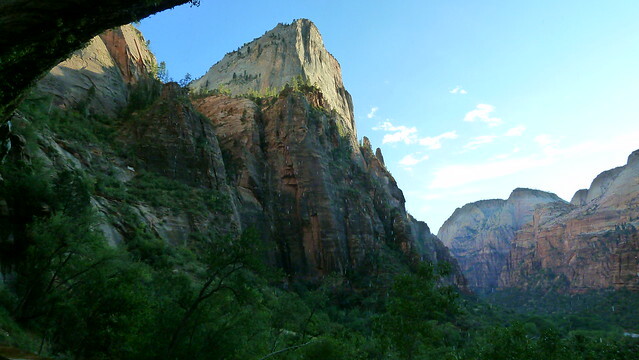 The West Rim Trail packs all the scenic beauty of Zion into one journey. Along the trail, hikers will see gorgeous trees and other plant life, small streams, wildlife, and, of course, stunning red rock. This strenuous hike is not for inexperienced hikers, but those able to make the journey will be glad they did. This trail begins at Lava Rock and winds its way through the most beautiful areas of the park. If hikers desire, they can even take a side trail to hike Angels Landing. When hiked straight through without detouring to other trails, West Rim Trail is about 18 miles long and takes two days. The amazing sights on this trail should put it on every experienced hiker’s Zion bucket list. Hikes through Zion give visitors the chance to see many incredible natural sights, test their physical and mental strength, and feel a sense of pride and accomplishment after hiking any of the above trails. Around every turn, there is something new and exciting to experience while on a hike in Zion National Park. All visitors have to do is pick their trail and let their journey begin. 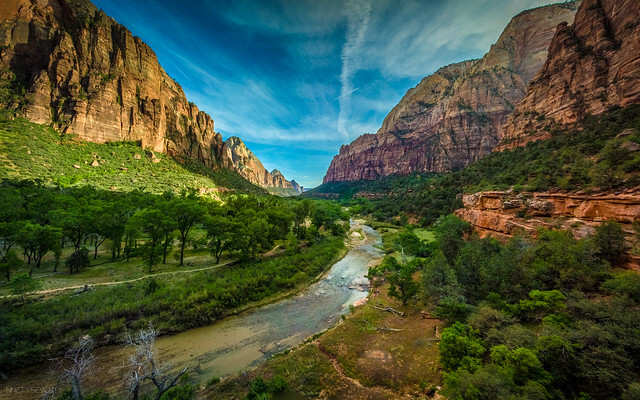 Zion National Park offers several grand hiking trails to visitors. It is totally different from other nearby parks including Bryce Canyon and Bryce Arches, which are the most popular parks in U.S. At Zion National park you can take the most exciting and strenuous trail through the surface of the Canyon to Angels Landing, or through beautiful waterfalls, but it is suggestible not to attempt if you are scared of heights. The narrow hikes during the mid summer months will take you straightly into the river and to the extent to upstream. At some places the water will be around 4-5 feet deep, so it is advisable not to take expensive camera with you as it may get damaged. To reach Pa’rus Trail, round-trip is about 5.6km/3.5mi, and it takes around one and half hour to reach the trail. The hike is suggestible for beginners, easy hike, and paved trail takes to Virgin River from South-Campground to the Zion-Canyon junction. You can reach the Pa’rus trail through South Campground. Handicap individuals can enter through South Campground. Round trip to weeping rock trail is about 0.8km/0.5mi and to reach the trail it takes about half hour. The trail is about 98 feet, easy hike, and minor drop-offs. Smooth trail ends at rock-alcove with drenched springs. The walls are decorated with wildflower hanging gardens during summer and spring time. Trailside exhibits are possibly not available and access to weeping rock trail is through weeping rock parking lot. Round trip is about 3.3km/2,0mi, it takes around one and half hours to reach the trail, and the climb is 17m/57ft. The hike is easy, minor drop-offs. The paved trail leads to the Virgin River through the narrow Zion Canyon bottom. The surroundings are coved with hanging gardens of wildflowers especially during summer and spring. Access to the trial is through Temple of Sinawava parking-lot. Access to Handicapped individuals is permitted. Round trip is about 1.9km/1.2mi,and it takes about one hour to reach the trail, 21m/69ft ascent, easy hike and minor drop-offs. The paved trail leads you to 3 waterfalls and lower pool. During winter the trail is closed. Enter the trial through opposite side of lane from Zion Lodge parking-lot. Round trip covers 3.3km/2.0mi and it takes 2 hours to reach the trail, 46m/150ft climb, it’s a moderate hike, and long drop-offs. Middle emerald pool trail takes you to middle and lower pools. During the winter the park is closed. You can enter the park from the opposite site of the lane from lodge parking lot. The round trip to the trail covers 3.3km/2.0mi and takes 2 hours to reach the trail. 112m/368ft ascent and it’s a moderate hike, minor drop-offs. It is advisable to reach the trail early in the morning or late in the evening to avoid heat. The trail ends at Oak Creek Canyon, lower Zion canyon, and Springdale town. Round trip covers 1.6km/1,0mi and takes approximately one hour to reach the trail, and the ascent is about 50m/163ft, moderate hike and long drop-offs, the entire area is fenced. The trail is rocky, rough and it ends at outstanding viewpoint of Pine Creek Canyon and lower Zion Canyon. Enter the trial from Zion Mt. Carmel Highway towards the east end of lengthy tunnel. The Zion Narrows can be approached in two ways, one is Short Day-hike and the other one is Day-hike. Short Day-hike takes one to 5 hours roundtrip, the trail follows upstream a head of the Riverside Walk, no permit required. For Day-hike, you need to take shuttle to trailhead, and it is an all-day hike. You must pay $5.00 per head to enter the trail. Get the permit at Zion Canyon Visitor Center at 8.30 a.m. the previous day before your hike. Round trip is 8.1km/5.0mi and average time to reach the trial take 4 hours. The climb is about 453m/1488ft, strenuous hike, long drop-offs and very narrow trail. Not recommended for individuals who are scared of heights. The trail ends at the peak high above Zion Canyon terrain. Towards the end of the trail around 0.8/0.5mi will be very steep and narrow ridge, for safety the park authorities has arranged chains to hold on. You can enter the trail from Grotto Picnic area. Round trip is around 13km/8.0mi, average time to reach is about 5 hours, and climb is about 655m/2148ft, strenuous hike. The trial follows through Echo Canyon to Observation-point. The trail offers you splendid views of Zion Canyon. You can enter the trial through east rim. The last one is Plateau trails, Deertrap Mountain and Cable Mountain; you can enter the trail from Weeping Rock picnic spot. These are the Trails obtained for visitors in Zion National Park. Each trail has their own specification and you can explore one after the other during your visits. 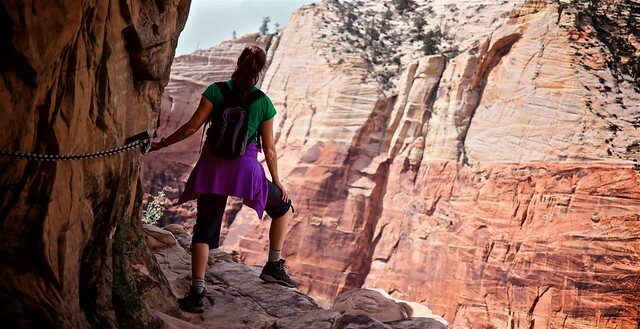 Enjoy and experience the best hiking at Zion National Park. 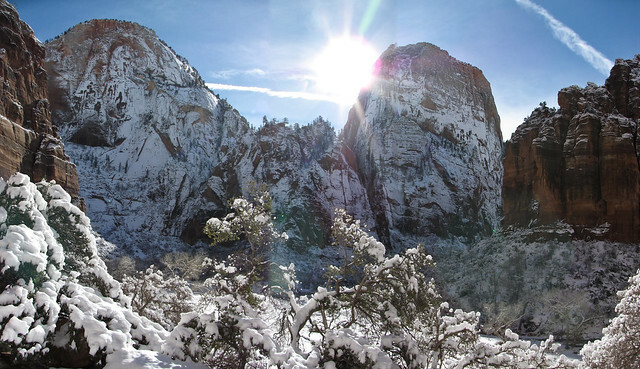 Zion National Park offers a plethora of different activities for all ages even during the winter season! It’s no wonder really why so many people spend Christmas in Zion! It’s such a beautiful and fun place to visit even during the winter. Staying in Springdale, which is widely known as “The Gateway To Zion” is the perfect family getaway. Springdale is known for its spunky and fun atmosphere and all the different events they hold year round. This is the time of year to get away with your family and enjoy some quality time together, and what better place than Zion? During this time of the year the park is much less crowded which means less stress for a family vacation! During this time of year Springdale holds many amazing concerts, shows, events and more all in spirit of the Holiday Season! Enjoy a day hiking and exploring Zion Canyon, and spend the afternoon dining at local restaurants Then sit back and relax in a hot tub at the resort or enjoy a night out on the town! If you plan your trip right, you can enjoy all the festivities during the Christmas and New Year holidays in Springdale. Their annual events are beyond fun and exciting and give you and your family the perfect opportunity to meet people from all around the world! So for your next Christmas Vacation, make sure you book with Bumbleberry Inn and enjoy a beautiful, fun and family friendly stay. East of The Great White Throne tucked away is Hidden Canyon which is a stunning “hanging canyon” that visitors can explore. This hike is pretty cool cause depending on how far you want to explore into the canyon, it can last from 3-6 hours. It offers beautiful views and good obstacles to overcome. This is a more strenuous hike and is not suggest for the faint of heart or those who are afraid of heights. The trail climbs the east side of the canyon, access to the trailhead starts at Weeping Rock Trailhead. The beginning of the trail will start with a few uphill sand covered switchbacks, as you get to the top of minor saddle the trail will then follow the canyon wall where helpful chains have been set in place for hikers safety. Eventually it will descend into a little shaded valley. Now for the fun part of the trail, there will be sandstone carved steps that lead up to an exposed ledge where more chains have been set in place for hikers to hold onto. This section can be quite scary for those afraid of heights! There will be a path that has been carved into the sandstone wall as well. After conquering that section you will have officially reached Hidden Canyon, be careful as you cross over the stream bed for there are potholes that are filled with water. This is technically where the trail ends, but you can keep on hiking around for about another mile and explore beyond the trails end. If you decide to hike on, there will be plenty of overgrown gardens, mossy covered rocks, and there is even a small arch to be found. The more you hike in the more the trail has to offer. There’s so much to be seen on this trail and it can be a lot of fun with the right crowd of friends! For those who are less familiar with Zion, Kolob Canyons is part of Zion and is located on the northwestern side of the park with an entirely separate entrance. This is a great place to hike and explore if you are looking for a little bit of solitude as it has fewer visitors. Most don’t know that Kolob is part of the Zion Park, which means that you can use your annual or interagency passes! Kolob Canyons offers several hikes and overlooks and is definitely just as stunning as the main part of Zion National Park, just a bit more crimson in color! Here are a few of the hikes you can take if you visit Kolob Canyons. If you’re looking for a fun family hike with tons of wild life then Taylor Creek is definitely a hike you will want to go on. This is a 5 mile hike that takes most 4 hours to reach the end and back. This trail takes you into a narrow box canyon toward the double arch cove. On the trail you will criss cross over Taylor Creek multiple times giving you the chance to splash and play in the water to cool off before moving forward. Prepare to be captivated by Tucupit and Paria towering 1700ft above you as you reach the end of the trail to the Double Arch Alcove. This is a short and easy mile long trail that takes most about 30 minutes to complete. The trail leads you along a small ridge offering beautiful views of Pine Valley, Kolob Canyons and Kolob Terrace. If you are hiking in the spring months you will get to see the trail and mountains covered in wild flowers making the view and experience just that much more spectacular. Kolob Arch is the second largest arch in the world! So getting a chance to see this amazing rock formation is quite the experience. The trail is for the more advanced hikers as it is more strenuous and takes about 7 hours one way. This is a good hike in and camp experience! 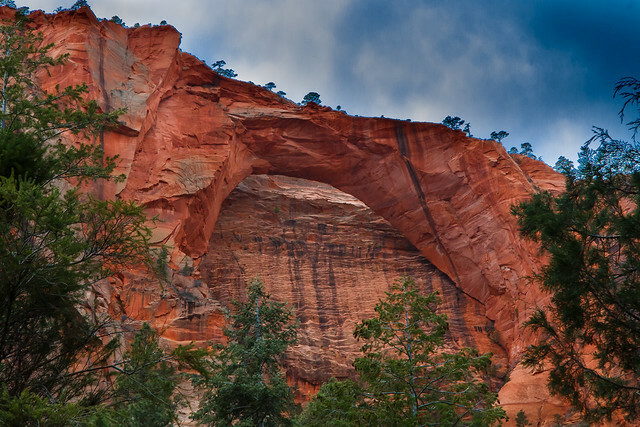 For more information on the Kolob Arch trail heads visit the Visitors Center.